In this area of the Apparel Search fashion brand directory, you will find women's fashion brands from leading apparel companies and fashion designers. On this particular page, you will find information regarding women's clothing with the Merrell brand. You are welcome to utilize this section of our clothing guide to review Merrell news, Merrell blog posts, Merrell photos, and more. When women get out and hit the road or mountain trails, they apply their own brand of strength, agility and natural athleticism to the challenges of the outdoors. The right gear can help you conquer many obstacles, whether you are a casual walker or a serious hiker. This is why the women's collection from Merrell includes all the right shoes and outdoor gear and apparel for maximum protection and comfort. In addition to footwear like women's hiking boots and shoes, Merrell has the right tees, tanks, pants, skirts, socks, insoles, beanies, and backpacks. Your gear does not necessarily define your outdoor lifestyle, but it can enhance your experience and make it much more enjoyable. In 1983, the first Merrell products were delivered to market. That same year they introduced their first women’s hiking boot with QForm® comfort technology, specially designed to fit the unique profile, bone structure and stride of female hikers, for greater comfort and performance. 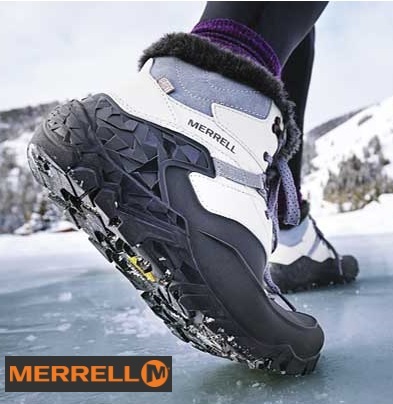 Merrell is an American footwear company founded by Clark Matis, Randy Merrell, and John Schweizer as a maker of high-performance hiking boots. In 1985 they launched our Eagle model, that combined running shoe performance with backcountry utility to create lighter and faster footwear for the trail. It was the first of its kind in Merrell history and marked the beginning of their movement towards ground breaking multi-sport technology. In 1993 they released their first cross-trainer model. Exploration and following their own path has been in the Merrell brand nature since day one. Today, Merrell continues to make some of the world’s greatest footwear, apparel and accessories. It’s the kind of stuff they wear themselves when they are out enjoying the great outdoors, and the company is happy to see that so many people outside the company have been wearing their product as well. Learn more about the women's Merrell brand clothing & footwear. If you have changed your mind and do not wish to research the brand Merrell, you can use the search engine on this page to find another clothing label that may be of more interest. Apparel Search is a leading guide to fashion, style, clothing, glam and all things relevant to apparel. We hope that you find this Merrell page to be helpful.